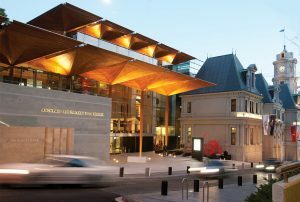 The Auckland Art Gallery Toi o Tāmaki uses the Outward Loan file from the Activities module, together with Procedural Control, to help manage their busy outward loans program. This ensures that all loan requests are well documented, and processed are in a consistent, streamlined fashion. When a formal loan request is submitted to the gallery, a new Outward Loan record is created with a procedural status of Request Received. Relevant information is entered in the appropriate fields, including the Loan Start and End Dates, Borrower, Exhibition Itinerary, Exhibition Title, and any staff involved in assessing or preparing the artworks. The artworks requested for the loan are linked in the Objects and Activities window, after which, the Check Conflicts button is clicked. This identifies any artworks that are unavailable for the dates requested. This could be due to their involvement in an internal exhibition, an outward loan to another institution, or a mandatory rest period. After checking for scheduling conflicts, the record is saved. It is at this point that procedural control comes into play, automatically generating any reports and actions configured for the “Request Received” status. As the loan moves through different stages of assessment and preparation, the procedural status is changed. Any time the record is saved with a new status, different reports and actions will be generated depending on what is required for that stage of the workflow. This level of automation saves time and promotes consistency throughout all stages of the outward loans process. The following is an outline of some of the procedural statuses the gallery uses, and the accompanying actions and reports. Word Merge Acknowledgement Letter: The first report to generate is a letter formatted with the Auckland Art Gallery header and footer, addressed to the person who sent the request. This letter acknowledges that the gallery has received the request and will begin the assessment process. Word Merge File labels and Checklist: The gallery keeps a physical file of any hardcopy documents relating to the loan. These reports generate labels for the file, with details of the borrower, exhibition title, exhibition and loan dates, as well as a checklist of actions to be completed. Word Merge Loan Assessment Form: This is a report that gives the details of each artwork requested in the loan. This document is saved to a shared drive where relevant staff can access it. It has areas for curators, conservators, technicians, and registrars to add their comments and recommendations. These may include the work’s suitability for exhibition or travel, any treatment, necessary framing or glazing, and packing, crating or courier requirements. New Loan Request Email: A new message is opened in Outlook with a template stating that a new loan request has been received. The Borrower, Exhibition Title, Exhibition Dates, and an object count are entered in the body of the message. The email is addressed to the curator, conservator and technician as specified on the Outward Loan record. Hyperlinks to a copy of the loan request letter and to the Loan Assessment form are manually inserted so the email recipients can add any comments or recommendations they may have. Once completed the Loan Assessment form is presented to the gallery’s loans and acquisitions committee for their consideration. Once a decision has been reached, the status of the Outward Loan record is updated to Request Approved or Request Declined. Word Merge Loan Declined Letter: This is a letter, formatted with the Auckland Art Gallery header and footer, addressed to the Contact person. An explanation is manually entered, detailing why the gallery was unable to approve the loan request at this time. Request Declined is flagged as a Completion Status, so this loan request will not be included in future conflict checks. Word Merge Loan Approved Letter: This is a letter, addressed to the contact person, informing them that their loan request has been approved. Word Merge Loan Agreement and Object Schedule: This agreement between the Borrower and the gallery is populated with the Borrowers information from the Outward Loan record. A separate Object report is also generated and attached to the agreement. This contains details of the artworks included in the loan, with additional information such as insurance values and credit lines. These documents are sent to the borrower for their signature. Once both parties have signed the loan agreement, the record’s status is updated to Agreement Signed. When a record is saved with this status a list of tasks pops up. Any required tasks can be selected and assigned to the relevant staff member. Examples include condition reporting, photography, and crate fit-out. The Gallery uses Diary Checking on log on, so staff will see any due tasks assigned to them any time they log in to Vernon CMS. When the artworks leave the building, the status of the Outward Loan record is changed to Objects Fully Dispatched. Bulk move: This procedural action opens the bulk move window so that all objects associated with the loan can be moved to an “On loan” location, with the borrowing institution entered in the External location field. Word Merge Invoice Loan Costs Memo: This is a memo addressed to the gallery’s Accounts Manager requesting that an invoice be raised for any associated loan costs. It is populated with details for the invoice, such as the Borrower and Exhibition Title. Invoice loan costs email: This procedural action generates an email to the gallery’s Accounts Manager. The Loan Costs Memo is manually attached to the email before it is sent. At the conclusion of the loan, when the artworks are back on-site, the status of the record is changed to Objects Fully Returned. Bulk move: This action opens the Bulk move window. Artworks are then returned to their Usual Location, or to a Temporary Location while they await their final condition check. Works returned from loan email: This action generates an email to the appropriate conservator, stating that the objects have returned from loan, and requests that final condition reports be completed. The ‘Condition Report Returned Loan’ task can also be selected and assigned to the conservator, so they are reminded of this task when they log in to Vernon. These are the procedural statuses used most frequently, but there are others that have been created under different circumstances. While it is possible to create additional statuses for other stages in the process, the current configuration works well with the gallery’s workflow. The reports, actions and tasks that are associated with each procedural status have been refined and updated over time so that all loan requests are documented and processed consistently.